Angie Never is an enthusiastic and knowledgeable teacher in Columbus, OH, who has been sharing her passion for dance and yoga with students of all levels and abilities for nearly fifteen years. She is a certified Advanced Teacher and SSCE Instructor of ATS®. 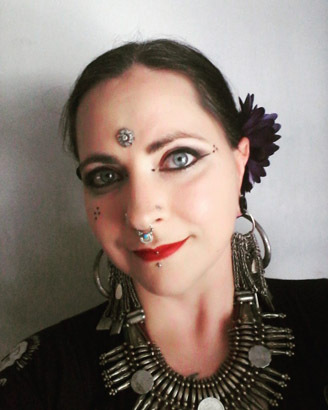 She took her first bellydance class in 1997 and instantly fell in love with the feeling of sisterhood among her fellow dancers and the opportunity to connect with her own body in a new way. In 2002, she founded Sacred Shimmy Tribal Bellydance, a troupe of improvisational dancers and musicians who have become known for their energetic, joyful, and powerful performance style. In addition to her study of Tribal dance, she has trained and performed in Bengali folk dance and the Indian classical form Odissi and is a certified Tribal Grooves instructor. Additionally, Angie is recognized by Yoga Alliance at the ERYT-200, RYT 500 level, specializing in Hatha, Vinyasa, Prenatal, and yoga for at-risk-teens. She is a passionate body positive activist and the creator of Yoga Enlarged, a yoga class for the plus-size population that was the first of its kind in Ohio. She strives to offer all students a sense of empowerment, an awareness of their bodies, and a glimpse of the divine within each one. She loves road trips, playing accordion, and drinking chai.